US President Barack Obama has said that countries must take concerted action to spur global economic growth. President Obama was speaking ahead of this weekend's meeting of G20 finance ministers near Horsham, in West Sussex. He said the US had two goals at the G20 - to ensure joint action to jump-start economies and to move forward on a regulatory reform agenda. He added that he was optimistic about the meeting's prospects. "We are in this together," he said. 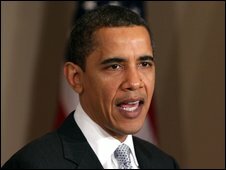 President Obama's comments came amid reports of a growing rift between the US and Europe over the G20 in recent weeks. Washington has been calling for more spending plans, while most European leaders have been pressing for increased global regulation of the financial system. US Treasury Secretary Tim Geithner said the Obama administration believes it is essential for other major countries to commit to substantial and sustained efforts to bolster their economies. Earlier, UK Chancellor Alistair Darling had also called for co-ordinated global action. "We must work together not as a small group of advanced economies but globally, including the emerging and developing economies," he told reporters in London. The finance ministers meet ahead of the main G20 summit of world leaders in London on 2 April. Meanwhile, developing countries are concerned that they will not have a voice at the summit, with only one African country represented at the meeteing. The US has already unveiled a huge stimulus plan aimed at preventing it slipping further into recession. Speaking at a meeting in the Oval Office with Treasury Secretary Timothy Geithner, Mr Obama said the $787bn stimulus package he signed into law last month was "doing a good job" stimulating the US economy. He added: "It's very important for the American people to understand that, as aggressive as the actions we are taking have been so far, it's very important to make sure that other countries are moving in the same direction, because the global economy is all tied together." On Tuesday the head of the US Federal Reserve, Ben Bernanke, also called for the revamping of the global system of financial regulation.